Just as expected, Florida has moved ahead to affect several milestone FL traffic laws in 2018. It’s quite easy to miss these traffic laws since the mainstream media has mostly focused on highlighting the minimum wage increase law in the Sunshine State. Florida approved slightly over 230 bills in the last fiscal year alone. It is absolutely necessary for all motorists to have a clear understanding of the newly introduced road user’s rules for both their safety and well-being. That knowledge helps the motorists to avoid getting into altercations with the state troopers manning the highways and roads. One shouldn’t have to take a Florida traffic school to dismiss a FL traffic ticket because they didn’t stay in the know with regards to the new laws that came into effect starting January 2018. Read on to learn more about how one complies with these new traffic rules to avoid incurring hefty fines and other severe road-related penalties. The most significant traffic bill approved in 2017 goes under the acronym, HB 647. This bill seeks to regulate the behemoth ride-sharing industry that has somewhat spiraled out of control in recent years. Cab hailing apps led by Uber and Lyft were among the major beneficiaries of the passed legislation. These ride-sharing service providers are not expected to fully comply with the same laws governing the conventional taxi companies in the Sunshine State. The HB 647 bill finally got the approval of Governor Scott on the 6th of June 2017. It had successfully passed several rounds of discussion in the house. Another hotly debated traffic rule that came into effect in January 2018 in Florida is the move over law. The Florida Department of Highway Safety and Motor Vehicles (DHSMV) now expects all motorists to pave the way clear for any emergency and service vehicles plying their routes. 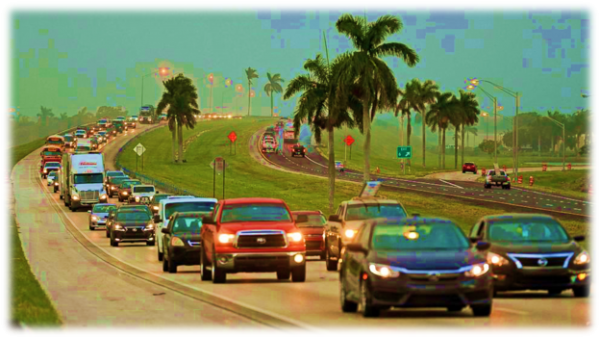 Last year alone, an estimated 17,000 motorists got slapped with a traffic citation for failing to move over for the first respondents, law enforcers, road rangers, and other utility services workers while on the Florida roads. The legislation seeks to improve the safety conditions for the thousands of workers working on the roadsides to repair and maintain our crucial roads. If successful, the law will ensure that these workers get to perform their jobs uninterrupted and most importantly, they get to arrive home alive and well. In addition to the newly approved traffic legislation, motorists are reminded that the laws that came into effect in 2017 will still be enforced. For instance, in mid-2017, Florida vetoed the bill effectively banning texting while driving laws. The anti-texting ban aimed to improve the safety of vehicle passengers, vehicle operators, other road users and bicyclists using our roads. Although the ban categorically bans texting, it also encompasses other communication modes, for instance, instant messaging and e-mailing while behind the wheels. If you do get pulled over for committing a traffic violation in Florida, one should highly consider taking a state-approved defensive driving course (also known as a basic driver improvement (BDI)) course to avoid getting points on your driving record. Taking a course will also serve to enlighten you on the currently approved road user’s laws. In Florida, these driving improvement courses get approved by the municipal and provincial courts. For the more experienced driver, who is age 50 or over, you can take a Florida Mature Driver course to get a discount on your car insurance. Check out the best Florida traffic school deals that not only saves you loads of cash but one that enlightens you on the essential road safety rules and regulations in your state.